The campaign witnessed a great number of eyeballs as the main aim was to attract multiple audiences who travel via flights during this festive season and thus increasing its brand awareness for LG Air Purifiers. LG Air purifier offers powerful filtration that reduces the harmful substances in the air, these innovative purifiers leave your home feeling fresh and clean, while potent sterilization removes floating viruses and germs in the air. LG PuriCare Air purifiers keeps the space clean and comfortable. From sleek designs to powerful performance and circulation this innovative range of air purifiers are designed to make the air clean and fresh to breathe. 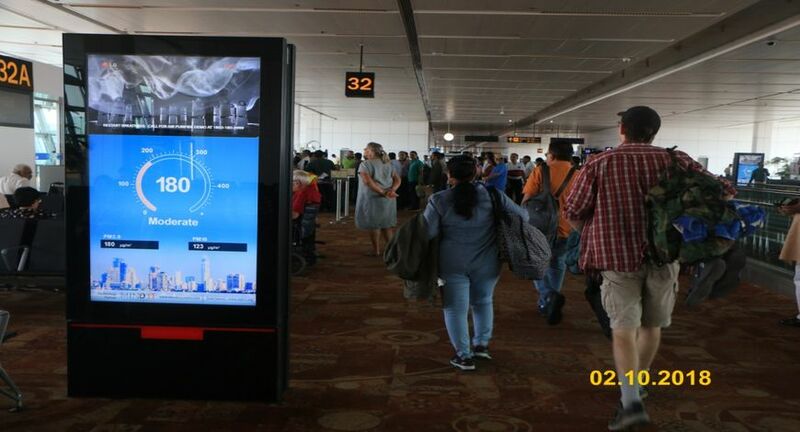 Laqshya Media installed over 312 digital screens at all terminals of Delhi. The LG Air Purifier commercial was displayed in the digital screens where the commercial used 1/3rd of the space whereas the rest of the space is utilized to display Live Air Quality Index (AQI). Laqshya’s scope of work also comprised of displaying the product placement and branding in premium plaza lounges; out of which 2 of them were displayed in Bangalore and 4 of it in Delhi. With a well-planned thought, the product is strategically displayed at the food joints and near smoking rooms at Delhi Airports which includes 9 units at Terminal3. On the occasion, Youngnam Roh-Director Home Appliances & Air Conditioners- LG Electronics India said " Health and hygiene are key concerns of consumers and they are looking for solutions to improve the same. Air quality has been of pressing concern for consumers, based on this insight we have developed the latest LG air purifiers, with PM 1.0 Sensor. This distinctive feature purifies even super-ultra dust particles from the air. We wanted to create an experiential marketing platform and Laqshya media has always shown great expertise in outdoor marketing with their campaigns. We wanted to create an eye-catching installation and believed that Laqshya will fit the bill perfectly. The installation of the air filter by Laqshya Media Group, at Delhi and Bengaluru International Airport has now become one of the biggest indicators and has given us an opportunity to celebrate our brand with our customers.